Max Verstappen came from the back of the pack to secure fourth place in the final race of the season in Abu Dhabi. The Dutchman, starting from sixth, collided with Nico Hulkenberg at the first corner, pitching him into a spin and sending him to the back of the field. 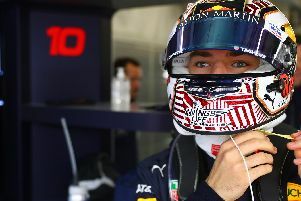 But making his tyres last, Verstappen found himself back at the sharp end as everyone else pitted, throwing him back into the race for the top spots. Having battled with Nico Rosberg for second, he was passed by the eventual world champion, and then by Sebastian Vettel to finish fourth, capping a remarkable recovery. The result means Vettel takes fourth in the overall standings ahead of Verstappen. Daniel Ricciardo meanwhile struggled to keep the pace with the front runners. After running with the top five prior to the first round of pit-stops, his pace dropped off and he came home fifth ahead of Ferrari rival Kimi Raikkonen.